The Arona Gran Hotel is very elegant and is even located within its own very picturesque gardens. It’s very close to the bay at Los Cristianos, so you get stunning views from the bedrooms, whilst over guests overlook the beautiful swimming pool and gardens that the hotel has on offer. Each room in the hotel comes with satellite TV, telephone, mini bar and hairdryer, and you can even have a safe for your valuables at an extra cost, making these rooms really well equipped for the perfect holiday. There is a restaurant, bar and swimming pool on the hotel site, as well as a hair dressers and fitness centre to keep you pampered and trim, plus a packed entertainment programme and fully stocked games room to keep the kids out of your hair. The hotel even has the added bonus of having disabled rooms, meaning they accommodate any guests, so you can be rest assured that no matter who you are you’ll have a great time. 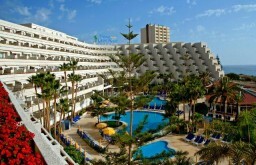 Superb views and facilities around the hotel, making this practically a miniature holiday resort right in Los Cristianos.